Janus Decision: Why Does Labor Keep Losing? Wolff is professor of economics emeritus, University of Massachusetts, Amherst and currently visiting professor in the Graduate Program in International Affairs of the New School University, New York City. 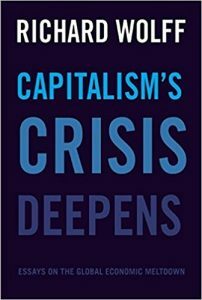 His most recent book is Capitalism’s Crisis Deepens: Essays on the Global Economic Meltdown. He is a contributing author to Living in a Socialist USA. Wolff is host of the program “Economic Update” and founder of Democracy at Work.